Proceeds from the sale of these books goes toward SOT Research. There are eight conference proceedings to choose from. 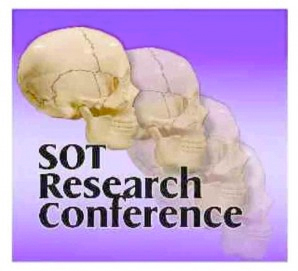 The 2017 Conference Proceedings offers 10 new full text articles and full text articles from past-SOT Research Conferences (2009-2016) that relate to dental chiropractic co-treatment of TMD with a focus on SOT and SOT Cranial/TMJ interdisciplinary care Over 270 pages. No where else is there a gathering of this TMD dental chiropractic evidence based care. The proceedings also has information regarding research, evidence informed healthcare, how to produce a poster presentation and more. The 2016 Conference Proceedings offers 19 full text abstracts relating to topics such as SOT, cranial techniques, chiropractic manipulative reflex technique, occipital fiber diagnosis, and dental chiropractic co-treatment of TMD. Over 200 pages. The proceedings also has information regarding research, evidence informed healthcare, how to produce a poster presentation and more. The 2015 Conference Proceedings offers 11 full text abstracts relating to topics such as SOT, cranial techniques, chiropractic manipulative reflex technique, occipital fiber diagnosis, and dental chiropractic co-treatment of TMD. Over 200 pages. The 2014 Conference Proceedings offers 15 full text abstracts relating to topics such as SOT, cranial techniques, chiropractic manipulative reflex technique, occipital fiber diagnosis, dental chiropractic co-treatment of TMD, Alexander Technique, and Aqueous Ozone for Chiropractic Table Sanitization. Over 150 pages. The 2013 Conference Proceedings offers 26 full text abstracts relating to topics such as SOT, cranial techniques, chiropractic manipulative reflex technique, occipital fiber diagnosis, and dental chiropractic co-treatment of TMD. Over 210 pages. The 2012 Conference Proceedings offers 3 invited commentaries and 15 full text abstracts relating to topics such as SOT, cranial techniques, chiropractic manipulative reflex technique, occipital fiber diagnosis, and dental chiropractic co-treatment of TMD. Over 130 pages. The 2011 Conference Proceedings offers 17 full text articles relating to SOT, cranial techniques, and dental chiropractic co-treatment of TMD. Over 120 pages. The 2010 Conference Proceedings offers 6 invited full papers and 26 full text abstracts relating to SOT, cranial techniques, and dental chiropractic co-treatment of TMD. Over 160 pages. The 2009 Conference Proceedings offers 28 full text abstracts relating to SOT, cranial techniques, and dental chiropractic co-treatment of TMD. Over 100 pages.